Minibushire.com.au offer a 24/7 airport transfer service 365 days per year – if you need economical transport to any airport in or around Brisbane, then you have come to the right place. Get a free online quote using our fuss free three step booking system and book your airport transfer today – meet and greet service is availalbe on request. If you are travelling to Brisbane soon and would like to know more about the available airports both in the immediate and surrounding regions, this is a comprehensive guide to the Brisbane airports that can serve both public and private aviation needs, below is a list of airports we will cover in this guide. 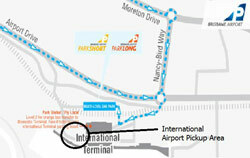 Brisbane Airport is the main airport serving the Brisbane area and handles more than 20 million passengers a year. The airport has an international terminal and domestic terminal; the international terminal has just undergone a major redevelopment and has a brand new Duty Free Departure store that is fully operational. Find pasenger information here. The international terminal operates 24/7 and provides world-class dining and shopping experiences. Brisbane Airport’s domestic terminal has also received newly upgraded and reconfigured food halls, a premium restaurant and bar as well as specialty retailers. If you wish to explore places other than the terminals itself while waiting for your flight, you can check out the Skygate. You can get to the Skygate via Airtrain or a Terminal Bus. There, you will find a bustling marketplace that is filled with bars and cafes, restaurants and shops. If shopping is not your cup of tea, you can check out the Skygate’s Discovery Centre or Golf Central complex. Once known as Coolangatta Airport, this is an Australian international and domestic airport that is located approximately 62 miles from Brisbane. The airport is regarded as the 6th busiest and 3rd fastest growing airport in the country. The airport has only one main terminal which opens from 4:30am till 11:00pm daily. The terminal is “locked down” for security reasons, thus passengers are not allowed to enter the terminal nor sleep overnight in the terminal during these hours. The main terminal has undergone an extensive re-development, which means that passengers can start their travel spree as soon as they arrive or before they reach their destination in Brisbane. The new arrival and departure halls provide a variety of shopping and dining experiences. If you are into surf, skate and street fashion, you should check out the Surf Dive ‘n’ Ski shop as they stock leading brands such as Element, Billabong, VonZipper and Hurley. If you get hungry, you can try dining at Hungry Jacks. This is one of the country’s favourite burger brands! Located approximately 72 miles from Brisbane, this is an airport that is owned, developed, managed and operated by the Sunshine Coast Regional Council. The airport has only one terminal, and it can be split into domestic and international terminals during the Air New Zealand seasonal flights to Auckland. The terminal is constructed with a single-storey concept and thus has no aerobridges. This means passengers must walk a short distance on the tarmac to reach their aircraft. The airport also offers passengers a range of dining and shopping options to choose from. If you favour the idea of having a hot, fragrant cup of coffee or a hearty breakfast, Velluto would be the right place for you. Alternatively, you can enjoy a light pub-style meal at The Glasshouse Bar while enjoying scenic views as well as a glass of wine. If you are curious to learn about the latest collections of fashion handbags, watches and jewellery from the best designers, you should head on to The Jewellery Lounge to discover a first class range of such items. This is one of the few airports that you may find near to Brisbane. It is a small regional airport that is operated and owned by the Ballina Shire Council. The airport has a single terminal that is open from 5am to 9pm daily and is capable of handling more than half a million passengers per year. Ballina Airport also caters to a small but active general aviation fraternity for both rotary and fixed wing aircraft, scenic and charter flights as well as pilot training. If you want to dine before takeoff, you can head on to Café Horizon which is located in the terminal itself. There, you will find a large variety of food and drinks that use the freshest, local produce. You may also wish to peruse their gift cabinet to pick something special to take home to a loved one, and you can choose from popular brands such as Australian Bush Spices, Byron Bay Cookies Company and Brookfarm. Whether you are a tourist or a local, you have to try their infamous Ballina Burger. It is something that is popular even amongst the airline crew! This is Australia’s newest airport and is the aviation gateway that connects south-west Queensland and Toowoomba to the rest of the world. The airport features a brand new state-of-the-art terminal which covers over 8,000 square metres. It has a contemporary design that utilises plenty of simple clean lines, glass and lights, polished stone flooring, a mix of timber and exposed concrete features. While more shopping options will materialise in the coming months, the airport presently offers great food at their Altitude Bar & Cafe. It is located between Gates 2 and 3 in the departure concourse, and near the arrivals baggage carousel. The airport recommends that passengers explore the heart of south-east Queensland if they are looking for an alternative to the same old urban locations or beaches for their travels. Do You Need an Airport Transfer Service in Brisbane? When picking up clients from the Brisbane International Terminal your minibus driver will be waiting in the Airport Corral until 15 minutes after flight has landed. They will then contact the passenger by phone to ensure they have the instructions to the bus and coach pick up area (below). Once this has been confirmed then the driver will proceed to the undercover Bus and Coach pickup area. They will have the group name sign visible for the clients to locate their vehicle. The bus is only allocated 1 hour to greet clients, load luggage, load clients and depart the area. Any additional time will have to be charged to the client.